I’m super excited about this recipe. I made this up entirely from scratch and I’m pumped at how great it turned out! 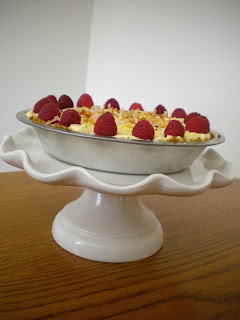 The inspiration for this dessert came from a Ralph’s Famous Italian Ices flavor called Coconut Raspberry Tart. With the temps finally hurdling over 60 degrees here in NY, my husband took a trip to Ralph’s last week for a treat. He came home and raved about the flavor so much, we wanted to recreate the same idea in pie form. 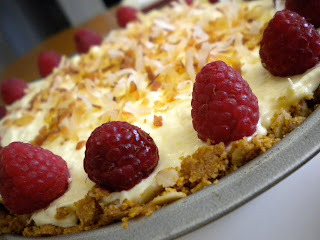 The result was Coconut Raspberry Cream Pie. Coconut cream pie is typically a flaky, buttery pie crust filled with rich custard made from egg yolks and tons of sweetened, shredded coconut. Then you top that whole shebang with a thick layer of real-deal whipped cream and more shredded coconut. It’s a delicious pie, but terribly fattening and packed with sugar. It’s the kind of dessert that has you plopped on the couch with your jeans unbuttoned in a post-sugar stupor. This just won’t do! Custard pies are fairly easy to lighten up and recreate. I started with the crust and worked my way up. 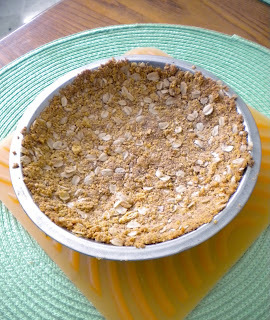 My crust is made from low-fat honey grahams and oatmeal. I did use real butter to make sure the final crust turned out nice and crispy. The last thing you want is a soggy mess. Or, have you ever been served a slice of pie where the crust is all crumbly and gets stuck in the pan? You end up with a plate full of smoosh. This crust will stay put when you slice it. What gives this dessert a little twist is the raspberry layer. It might sound odd, but trust me on this one, it’s amazing. 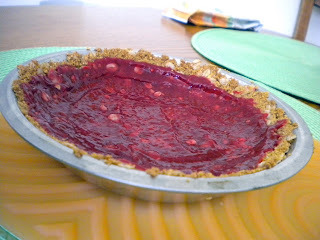 The raspberry adds the perfect tart element to balance out the sweetness of the filling. For the custard, I made the filling from sugar-free vanilla pudding mix and Cool Whip Lite. I will definitely mention that Cool Whip is wretched stuff. 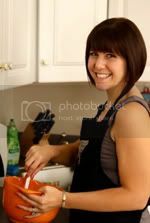 While I was making the pie, I tried a spoonful. Bleh! It tastes like flavorless marshmallow. I spit it out. Normally I don’t recommend using a product that’s a chemical knock-off of real food. But, have no fear; I’m using it sparingly in this recipe as a textural element. It gives the filling the perfect light and fluffy consistency without many added calories. There really isn’t a lighter alternative and you won’t actually taste it. Phew! This recipe calls for whole milk in the filling. Don’t be tempted to substitute low-fat or skim milk. I was tempted, I even tried it. That whole pie went right in the garbage! The pudding didn’t set and while it was chilling, a puddle of watery grossness formed on the top of the pie. Nasty! Skip the puddle and use the whole milk. Another few calorie savers include coconut extract. Most of the coconutty flavor in this pie comes from the extract. No mountains of shredded coconut = no post-sugar coma. A typical coconut cream pie is also topped with a thick layer of whipped cream. This is completely unnecessary here. The filling is creamy enough, just top with some fresh raspberries and a sprinkle of toasted coconut for garnish. I really should add one important disclaimer. Dessert is not exactly an every day meal for a health-conscious eater. Don’t go eating a whole damn pie because I told you this is a lightened up version! Keep portion control in mind and treat yourself once in a while. My recipe is designed for a 7” mini pie pan. For a couple of bucks, invest in one. It serves 4 and you aren’t left with a whole pie hanging around the kitchen calling your name at 2AM. Of course, if you want to make a full-sized version, just double the recipe and invite over some friends to share. I guarantee you could serve this to a group of diet doubters and they would find it just as delicious as I do. It’s that good! Trish, this looks amazing. And I love the letterhead you used on the recipe!